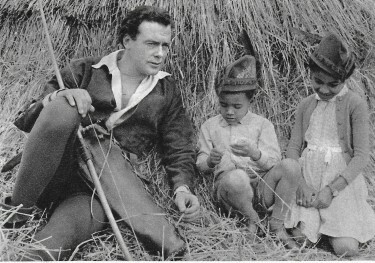 More from the ITV series The Adventure of Robin Hood – with Richard Greene as Robin Hood – Below with Patricia Driscoll – Maid Marian I hadn’t realise that Patricia Driscoll has appeared in 1956 with Max Bygraves in the Colour film Charley Moon which at the time was well promoted but it is rarely shown these days – I haven’t seen it for years but remember how good it was. 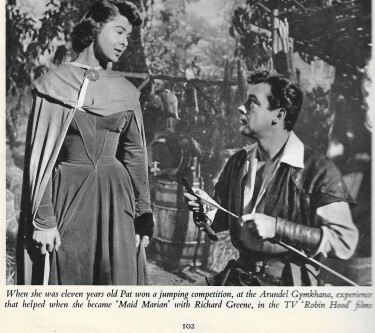 It was the following year that she took over from Bernadette O’Farrell as Maid Marian in this extremely popular Television show – and she made 36 episodes – she had also previously presented the Children’s Show Picture Book She was married for a lot of years to Duncan Lamont – an actor who cropped up on TV and in films all the time in the Fifties – and later. He died in 1978. 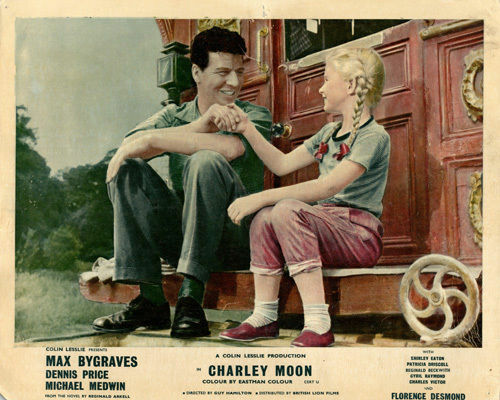 Above: Patricia Driscoll with Max Bygraves. “An unexpected telephone call from the Nettlefold Studios, at Walton-on-Thames, to the London mews flat of Pat Driscoll hoisted her to fame in the role of Maid Marian in TV’s ‘Robin Hood.’ When the phone rang, Pat was doing a spot of gardening-if ‘gardening’ is the right word to use about tending window boxes outside a town flat! The odd thing was that she seldom saw TV. There was no room in her small home for a set, and she didn’t like badgering neighbours to look in at theirs. Like her predecessor in the part, Bernadette O’Farrell, Pat was born in Cork. When her mind was made up that acting was the life for her, her parents sent her to RADA. After that, she worked her way around the country with various repertory companies. While with the Manchester Rep she met and married a dark Scot, Duncan Lamont. Duncan has also appeared in ‘Robin Hood’ from time to time. Their first home was in a London mews flat, where hammers, tacks, paint rollers and wallpapers made many demands on leisure time. Pat has been used to handling horses all her life, and had her own pony as a child and did a lot of show-jumping, in the modern manner. In fact, she was once a leading pony rider at the Olympia Horse Show. When she was eleven year old, Pat won a jumping competition at the Arundel Gymkhana. This helped a great deal when she took on the role of Maid Marian-though she found she had to learn to ride side-saddle to conform to medieval custom. 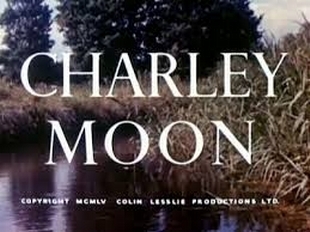 She took lessons from an expert to steer an elephant in the right direction in Charley Moon. ‘After that, riding side-saddle on a horse was child’s play,’ she’ll tell you. Pat’s favourite hobby, when she has time for it, is salmon fishing. When she is filming, an alarm clock shatters her sleep at six-thirty in the morning. After this early start she is ‘on set,’ ready with her make-up completed, at the Nettlefold Studios by eight thirty. The Above piece is actually taken from the www.disneysrobin.blogspot.com site, which we advise you to take a look at – it is superb and is totally focused on the wonderful Walt Disney film The Story of Robin Hood and His Merrie Men with Richard Todd and Joan Rice – 1952. 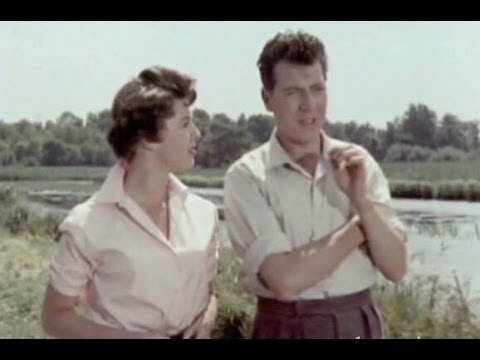 Above: Max Bygraves with a very young Jane Asher Richard Greene having a chat on location with young Merrie Men !!! Richard chats to Don Chaffey Film Director – and Below that getting into his car – Not sure what sort of Car that is either ? ?